The newly renovated Miami Beach Convention Center is Art Basel’s new standout and sustainable Miami Beach home. Since launching in 2002, Art Basel Miami Beach has become North America’s premier art fair. Leading US galleries as well as exhibitors from across Latin America, Europe, Asia and Africa attend the annual event, showcasing works by the masters of Modern and contemporary art as well as the new generation of emerging creative talent. And with the forthcoming fair to be held at the newly renovated Miami Beach Convention Center, this year’s event will include more exhibition space than ever before. 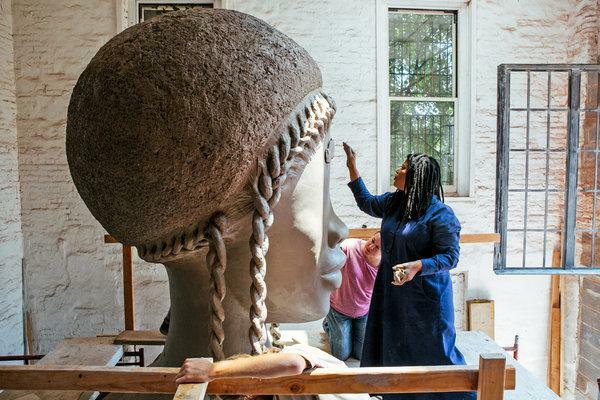 Visit Luhring Augustine (booth E11) during Art Basel Miami Beach, December 6–9 to see the extraordinary works of Simone Leigh / Photo: nytimes.com. From 6th to 9th December, 268 galleries from 34 countries will participate in the 17th edition of Art Basel Miami Beach, including 29 new galleries making their debut. Paintings, sculptures, installations, photography, film, video and digital art will be on display at the city’s new state-of-the art space, with several large-scale works at nearby Collins Park and SoundScape Park, where film screenings and performances will also take place. Following the format of previous years, the fair will be organized into sections. In addition to the main Galleries sector, Nova will feature never-before-seen pieces by new artists from established galleries; Positions will provide a platform for individual up-and-coming artists to present one major project; Edition will afford visitors the opportunity to see significant and rare publications; and project-based Kabinett is where galleries will be able to present a curated exhibition by an artist of their choice. Survey will house historical projects by artists representing a range of cultures, generations and approaches. Johannesburg-based artist Billie Zangewa will be taking part in this year’s Conversations program. Over the course of the three days, Art Basel Miami Beach will also host a series of artist talks, panels and discussions featuring a range of speakers, including artists, gallerists, curators and collectors, and architects, art lawyers and critics. Covering a wide variety of topics concerning the global contemporary art scene, this year’s Conversations program will explore issues including gender equality and feminism, the role of Blockchain technology and the recognition and rights of indigenous artists.